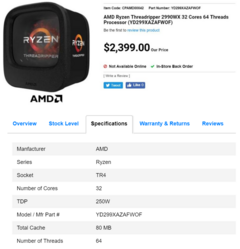 The 32-core 64-thread AMD Ryzen Threadripper 2990X gets a listing on CanadaComputers for CA$2,399 or around US$1,835. This is in line with the Cyberport listing last month that showed the price at €1,509. The listing also shows that the new Threadrippers will sport the same retail packaging as the previous generation. The AMD Ryzen Threadripper 2990X is a 32-core 64-thread behemoth that is the successor to the hugely successful Threadripper 1950X. The processor has popped up on CanadaComputers, which lists the price at CA$2,399 or US$1,835. This is not the first listing of the Threadripper 2990X in the wild, though. Around the same time last month, we saw the processor listed on Cyberport's site for €1,509. 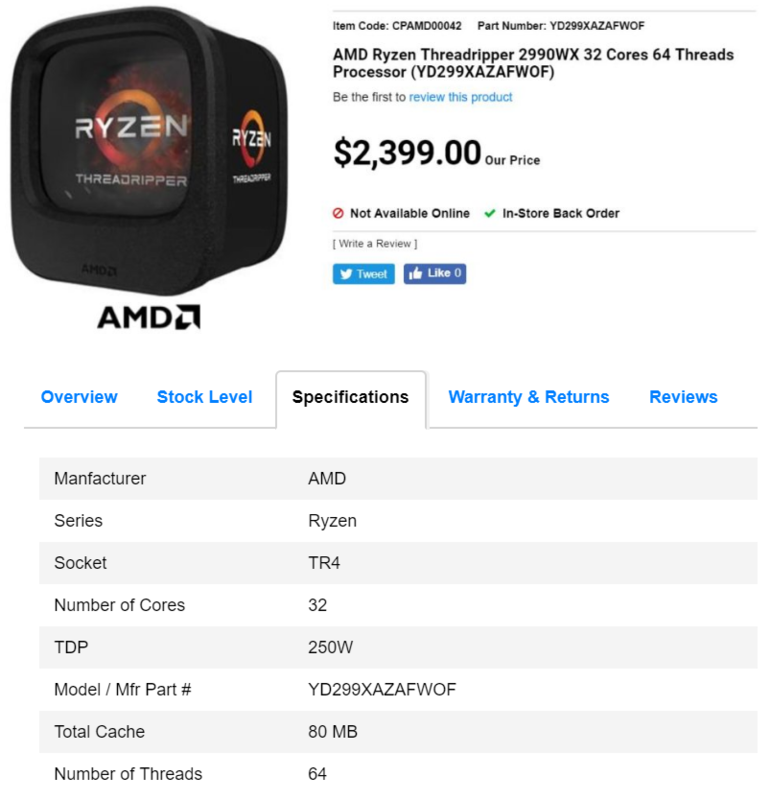 With two different price listings matching, we can be almost sure that the Threadripper 2990X will retail around the US$1800 mark or probably even less after the initial buzz. The Threadripper 2990X sports an impressive 80 MB cache (16 MB L2 + 64 MB L3) and a TDP of 250W, which of course increases while overclocking. It should be noted that the earlier Cyberport listing showed a TDP of 180W, which is most likely to be at the base clock. While single-core boost clocks can go up to 4.2 GHz, it is possible to get an all-core boost up to 4.12 GHz using a proper liquid cooling setup as demonstrated by HKEPC's benchmarks. The 2nd generation Threadrippers can be easily accommodated on existing X399 TR4 socket motherboards with a BIOS update. Just like the new X470 chipset for Ryzen 2 mainstream CPUs, new X399 Refresh boards, such as the MSI X399 Creation that was unveiled during Computex 2018, will be able to take full advantage of the new Threadrippers. With such a good price-to-performance ratio, the Threadripper 2990X has the potential to be lapped up by those who need the extra power for multi-threaded applications. A 32-core setup means that, theoretically, one can game, encode, stream, run multiple VMs at once, or even probably setup a cheap server that doesn't require as many PCIe lanes as provided by EPYC. Of course, applications themselves need to be optimized to take advantage of such high core counts. In the run up to release, we also expect to see details of other SKUs such as the Threadripper 2970X (24 core) and Threadripper 2950X (16 core) pop up on retail sites.